On August 29, 2005, Hurricane Katrina’s monstrous winds and surging water overwhelmed the protective levees around low-lying New Orleans, Louisiana. Eighty percent of the city flooded, in some places under twenty feet of water. Property damages across the Gulf Coast topped $100 billion. One thousand eight hundred and thirty-three people lost their lives. The riveting tale of this historic storm and the drowning of an American city is one of selflessness, heroism, and courage–and also of incompetence, racism, and criminality. I have vivid memories of watching the news coverage of Hurricane Katrina. Before social media’s prevalence, news came from TV, newspapers, and visiting websites. Turning on the TV before, during, and after Hurricane Katrina’s wrath often left me open-mouthed and in shock. The questions “How can this be happening?” and “Can this really be happening?” ran through my mind on repeat. 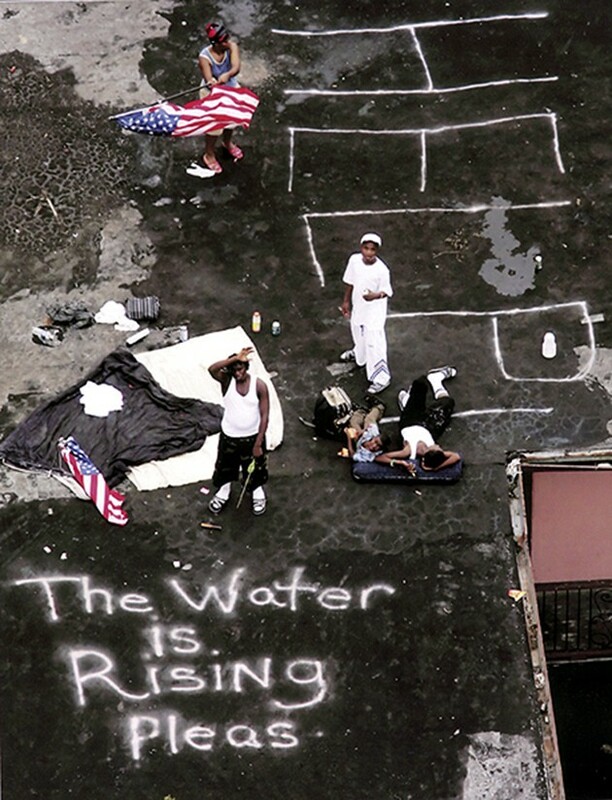 There are so many evocative images from Hurricane Katrina. Author and illustrator Don Brown artistically tells the story of the storm and aftermath. For this primary source pairing, invite students to analyze the image of New Orleans residents on the roof awaiting rescue. These painted messages on roofs are iconic to Hurricane Katrina and other devasting storms. If there is an image that comes to your mind when you think of Hurricane Katrina, use that one instead. There are many online image galleries of the storm – check out the links below. Finally, if the opportunity arises, use images from the devasting hurricane season of 2017 to compare and contrast the images and text in Drowned City: Hurricane Katrina and New Orleans and the destruction of Hurricanes Harvey, Irma, Jose, and Maria. What questions do you have while analyzing this image?